This post contains affiliate links. If you make a purchase through any link there is no additional cost to you, but I make a small commission that helps me support this blog! Digital photography is SO important in helping your website or blog to stand out from the crowd–especially when it comes to winning over clients or working with other individuals and brands. If you are really serious about blogging, I do recommend investing in a DSLR camera. While smartphones can take beautiful photos, you would be amazed at what a DSLR can do in comparison! 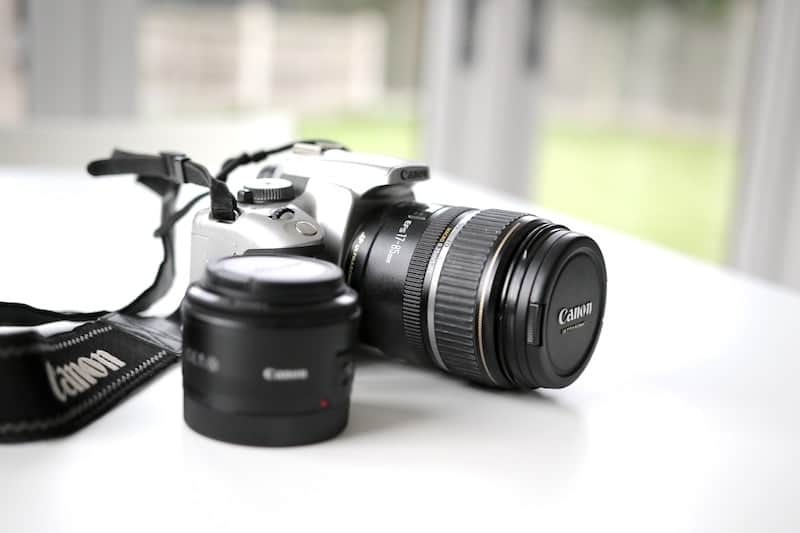 You don’t need to buy the most expensive camera– Nikkon and Canon have some great basic DSLRs that will do the job for you. I have a Canon EOS Rebel T3 and I love it! I got a great package deal during a Black Friday sale, and it came with a case and telephoto lens in addition to the camera. I recommend going and trying out different cameras to see what feels best in your hands. A shutter release remote is AWESOME for staging your shoots and waiting for just the right moment to snap your photo! It’s definitely a great accessory to have in your camera bag– and it doesn’t take up a lot of space! A tripod is another piece of inexpensive camera equipment that can make it SO much easier to take photos for your blog. Even though your DSLR will likely have image stabilization, the tripod is your friend when you want to have a 100% stable hand! This is the tripod I have, and I love that it’s easy to clip my camera in and you can adjust vertically, tilt and flip the camera between landscape and portrait. I also have a smartphone tripod for times when I don’t want to drag out my DSLR– it’s also great for shooting video on your smartphone. It comes with a remote shutter as well. If you are a food or beauty blogger, box lights can be great for photographing items when there is no natural light available. Lightboxes surround smaller items and allow you to easily bounce light and create contrast with the item you are highlighting for your shoot. They often come with colorful backdrops and LED lights. Ring lights are great for selfies and portrait pictures (and video too!). As its name implies, it’s a circular soft tube light on a stand that can easily be rotated and focused on the face (or wherever you want light). They are also easily portable for shoots. Editing software can be your best friend. I regularly use Adobe Photoshop to perform minor edits on my blog photography. Whether it’s adjusting the white balance, contrast or saturation, or even just cropping and removing unwanted items, it’s so nice to have the flexibility to edit. Sometimes I will love a picture, but it just needs a little editing to make it really pop, and that’s where Photoshop comes to the rescue! Adobe Lightroom is another photo editing software that, in my opinion, is more user-friendly than Photoshop. While both software programs use Adobe Camera Raw (ACR) processing engine to handle RAW files, Lightroom doesn’t change the original photo, rather it applies a set of instructions on how to process the file and then you export it. You will see a lot of Lightroom presets out there that are sort of like VSCO recipes for photos. Once you have them, you can process your photos through them and then export, rather than having to apply all of the edits to every single photo. One of the benefits of Lightroom is that its catalog takes up a lot less space on your hard drive! This is a really in-depth explanation of the differences between Photoshop and Lightroom. Snapseed is a very user-friendly and comprehensive photo editing app (from Google) for your smartphone. This professional photo editing app has 29 different tools and filters you can use to get your photos exactly the way you want! Snapseed works with JPG and RAW files and also has presets you can use on your photos. With my Instagram photos, I start editing them with Snapseed and then I apply a custom VSCO filter. My favorite aspect of VSCO is the HUGE number of filters it has and the fact that you can easily create your own filters using “recipes.” You can use VSCO to edit blog photos or for your Instagram feed. I think it’s a great way to give a cohesive theme to your Instagram feed, so I would definitely check it out if you haven’t already! If you do a lot of selfies, beauty blogging or close portraits, you NEED this app! Facetune allows you to easily perform cosmetic edits like whitening teeth, erasing blemishes or wrinkles and adjusting skin tones. You can also swap out backgrounds and apply a variety of lighting effects to your photos. This app runs on a yearly subscription pricing model ($9.99 for the year). Whenever Possible, Shoot in Natural Light! Natural light is always best! If at all possible, shoot in natural light. People are often surprised when they find that almost all food bloggers make their meals and set their tablescapes to shoot in the mid-morning or afternoon (when the light is warmer and less blue) for the best light. They might be shooting a dinner recipe, but almost every time that meal was made and photographed during the day! 🙂 Of course, if the weather doesn’t cooperate or you don’t have a great source of natural light you can always use a lightbox or other artificial light source. So much of photography is composing a photograph. You can have all of the technical skills in the world, but if you don’t know the basics of photo composition, it’s not likely to wow your audience! When you set out your items to photograph, try to think about what the ideal photograph would look like in your mind. Your goal is to focus the viewer on an element of your photograph, and this is especially important when working on sponsored posts! Framing a photo also gives it more depth. This article has some great tips for framing photos. The Rule of Thirds is often used in composing photos. To use the Rule of Thirds, imagine breaking your photograph into thirds both horizontally and vertically. You can use the grid feature on your camera or smartphone to help you with this process. You will be left with 9 different boxes and based on this theory you should place the objects you want to focus on along the four lines of the grid or at the intersections of these four lines. This is not a rule you have to abide by all of the time, rather it’s a guide for putting together your photos when you’re shooting. Photo props are items you use to form a “set” for your photo. For example, if you are doing a food photo shoot featuring a plated meal, your props would include silverware, colorful or patterned napkins, a tablecloth, vase of fresh flowers, etc. Props can also include textured backgrounds. A great way to create a beautiful backdrop for your photos is to use backdrop papers– I love to use wood designs! If you don’t want to purchase backdrop papers, you can always head to your local home improvement store and pick up large tiles to use! These work best for smaller scenes though. Don’t spend a fortune on photo props, look at thrift stores or in the clearance section of stores like HomeGoods, TJMaxx, and Target. It can be helpful to choose some basic items and a couple of different colorful accessories to make your photos pop! Take A LOT of Pictures! The beauty of digital photography is that you can take a TON of pictures and only keep the ones you want! I take A LOT of pictures from different angles and perspectives– up-close and from a distance. I never know until I sit down to edit my photos on my laptop which ones I will end up choosing for my post. Sometimes the photos I choose arent’ the ones I thought would turn out best! This goes along with the section above about using natural light whenever possible. Sometimes you do have to use a flash, but I avoid it at all costs. Unless you have a really good flash, it just tends to create a harsh light that washes your subject out. This article has some great advice on when to use a flash and when NOT to. It also offers some DIY methods for diffusing the light from your flash, which will make the light in your photos appear more natural. Pinterest is such an important platform to use as a blogger and you want to make sure that you optimize some of the photos on your blog for this purpose. Right now the Pinterest smart feed is favoring photos that are in a 2: 3-pixel ratio like 600px x 900px. I generally do 1200px x 1800px for the best resolution. As long as you use a photo that is in a 2:3 ratio, Pinterest will resize it appropriately. I recommend experimenting with different photo layouts to see what pins work best for you. You can choose to do a collage of images or a single image with a text overlay. Just make sure not to use super fancy scripts that are hard to read on mobile devices and make the text large enough to read easily. It also helps to have a good contrast between your text and the image it’s covering. Canva is a free platform that has some great Pinterest templates to get you started! It’s fun to take pictures from many different angles. Sometimes you discover a really cool perspective that you might not have considered! So have some fun and get creative with your photo shoots– you can always weed out the ones you don’t like when it comes time to edit your pics. I hope you have found the tips and tricks in this guide valuable! If you enjoyed the content above, don’t forget to sign up for my weekly newsletter and/or join the Build Your Best Blog Facebook group for more great info and inspiration.